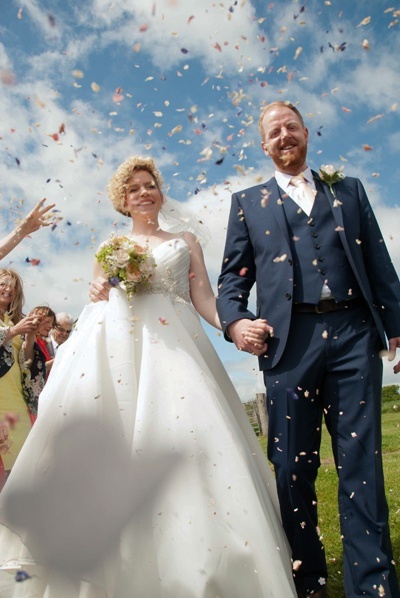 Michelle and Adam Browne have a very modern love story to tell - but their May marquee wedding theme oozes classic vintage glamour and home-made gingerbread favours. 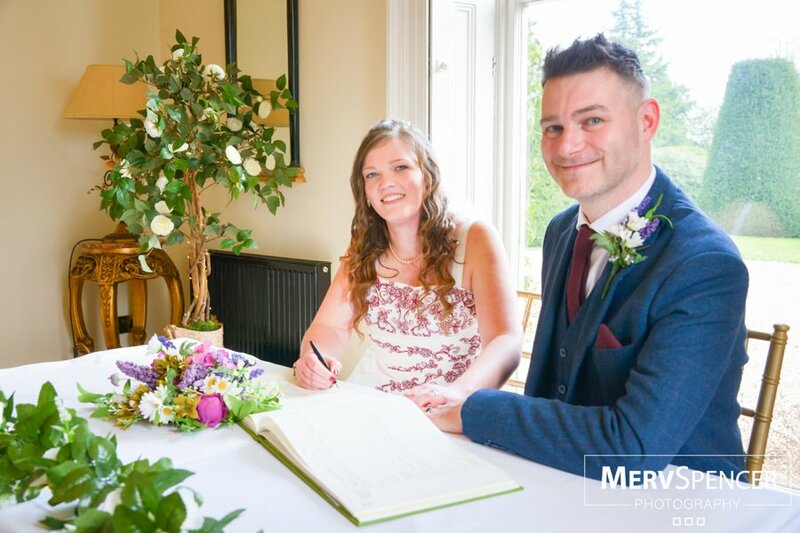 Where & when did you first meet: We met on mysinglefriend.com in March 2013 and our first date was in the bar Tilt in Nottingham. 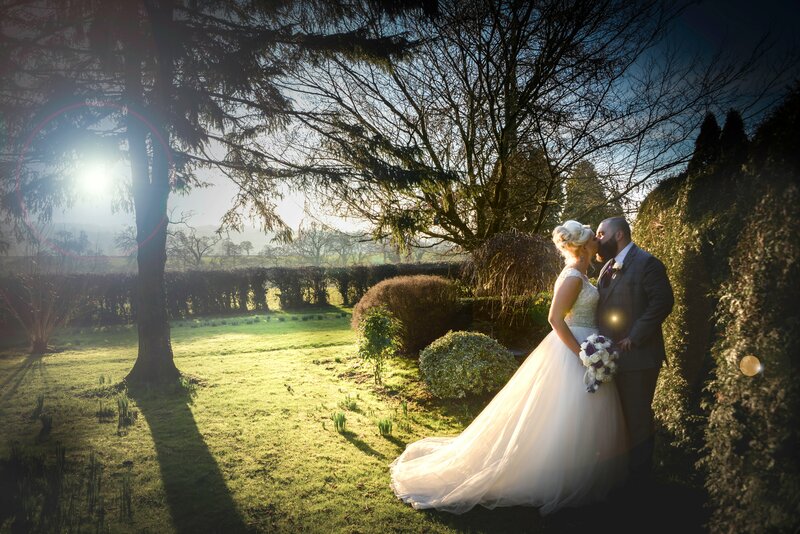 Tell us about the proposal: Adam proposed when we were on a weekend away in the Loveshack at Blackbrook Lodge, Turnditch. 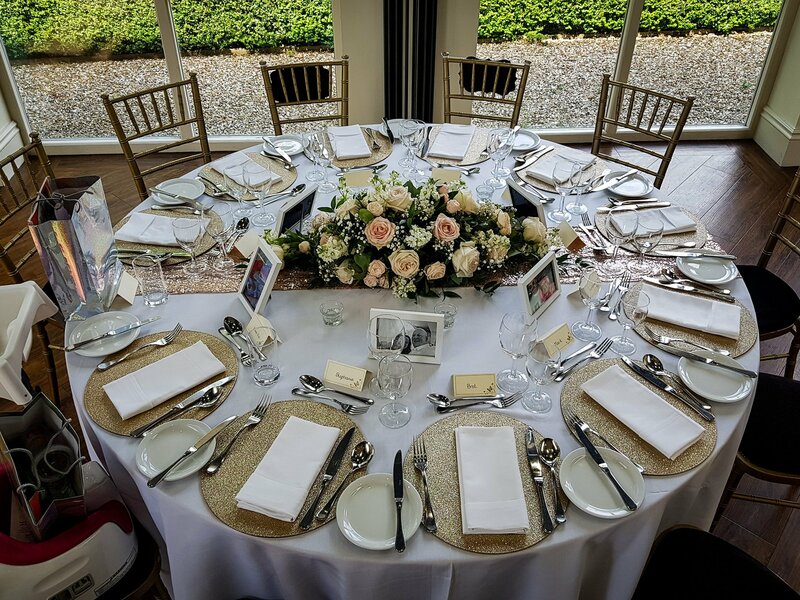 Why was Shottle Hall the perfect venue for your big day: We loved the coach house marquee as it was beautiful, had lots of character and stunning views. The dress: The Dress was a Mori Lee. It was completely different to what I thought I would go for but fell in love with it as soon as I put it on. I absolutely loved the beautiful embellishment on the back. 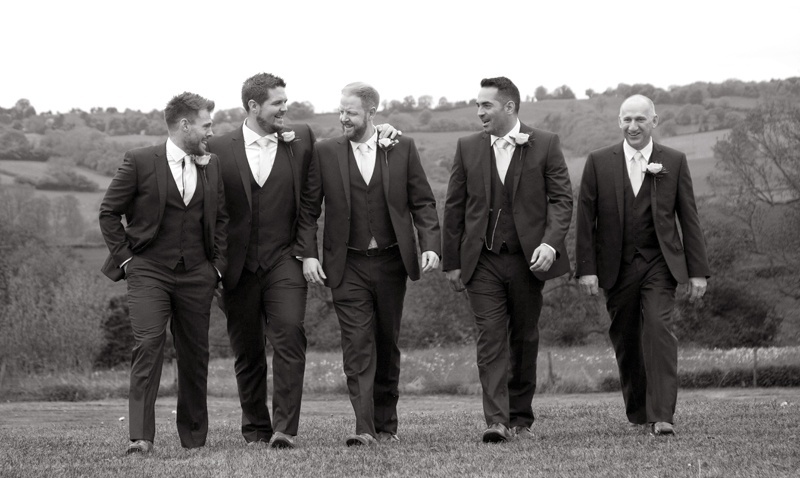 The Bestman – Jimmy Browne Ushers- Chris Treanor, Andy Oakes and Paul Foster Ringbearer- Matty Lumby Father of the Bride - Michael Foster All wearing Ted Baker suits. Bridemaids - Katie Foster, Paula Foster, Lucy Preston, Ruth Preston, Jess Lumby. Flower Girls - Daisy Browne and Sophia Preston. Bridesmaids were wearing Debut by Debenhams and flower girls wore Monsoon dresses. 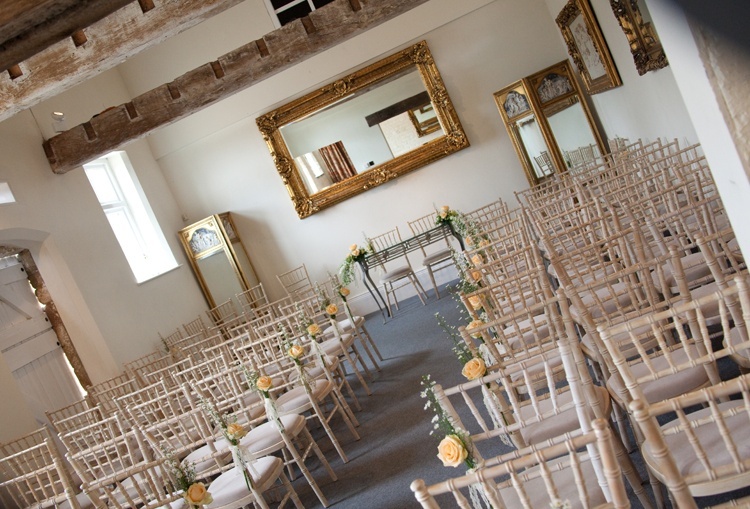 Your ceremony: In the stunning Coach house. Chair covers, decorations, favours: Decoration was quite simple. We had jam jars on the tables with wooden heart confetti. Gold birds were used as place names placed on the wine glasses. 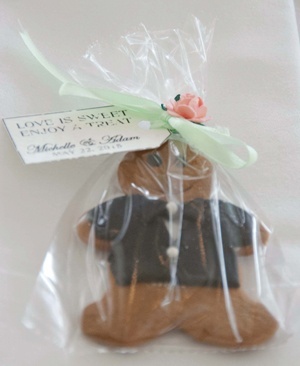 Our favours were gingrbread Brides and Grooms as we both have ginger hair!! 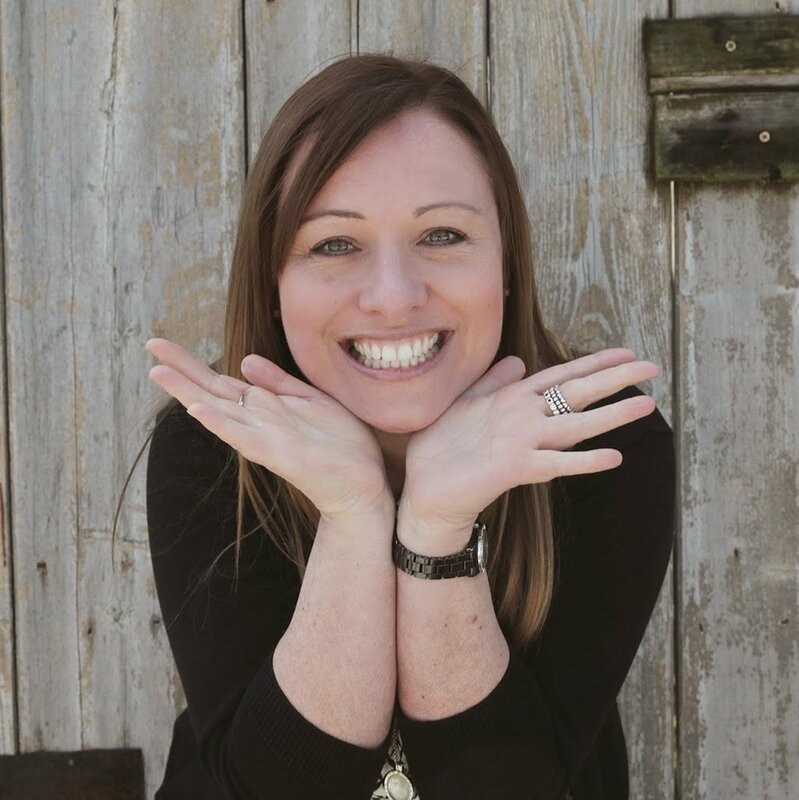 We created our own photobooth and used the app Wedpics for people to share their photos. We also had a fingerprint tree and wooden hearts for guests to write messages. 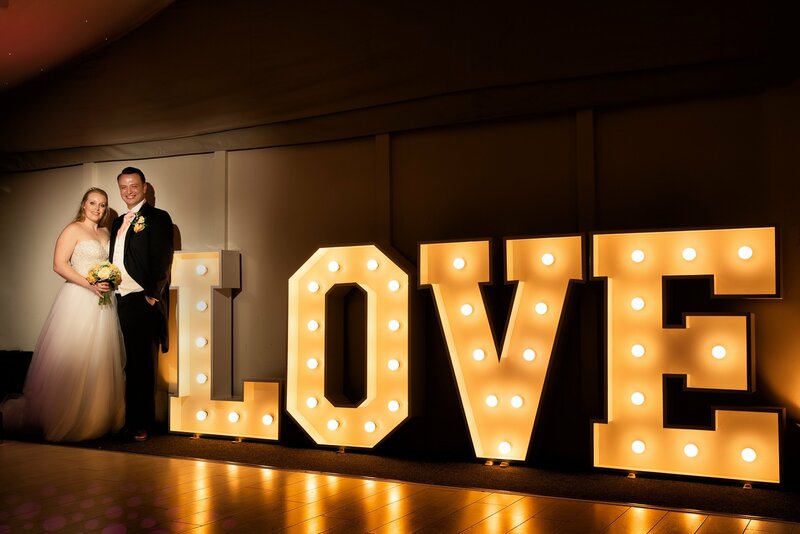 We had giant love and A and M letters supplied by Strictly Weddings. Cake: The cake was a surprise and a gift organised by my auntie, Jane Preston. It was so Stunning. 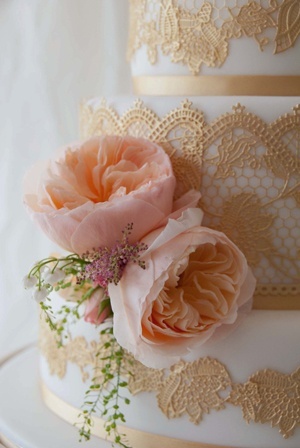 I loved the gold with the peach and pink flowers. Flowers: The flowers were by my cousin Lucy Preston. It was also a surprise. I simply told her the colours and she did the rest. I had David Austin Roses in my Bouquet. They looked fabulous. It was just truly perfect. Your theme: ‘Our love Story’ The invitations, table plan and table names were based on picture frames. Our table names were photos of key events of our relationship. 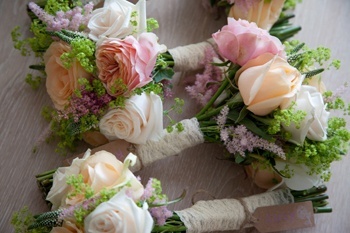 Colours and look: Vintage Glamour - Peach, pinks, creams, mint with flashes of gold. 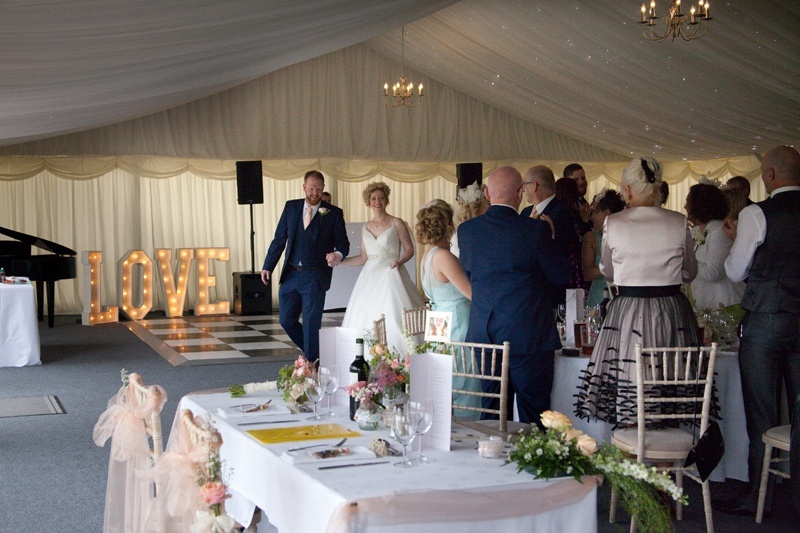 Evening Reception: In the fabulous marquee. 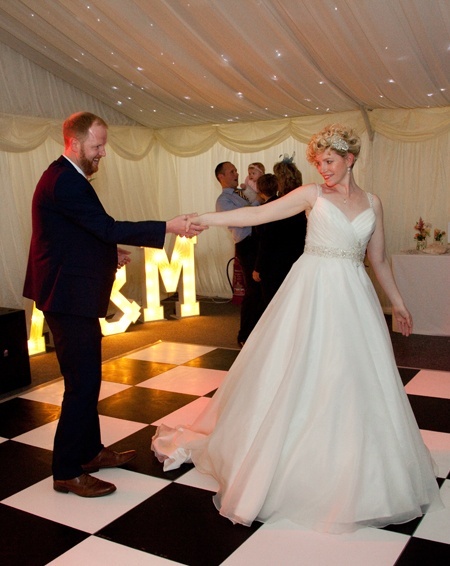 Our first dance was ‘Thinking Out Loud’ by Ed Sheeran. 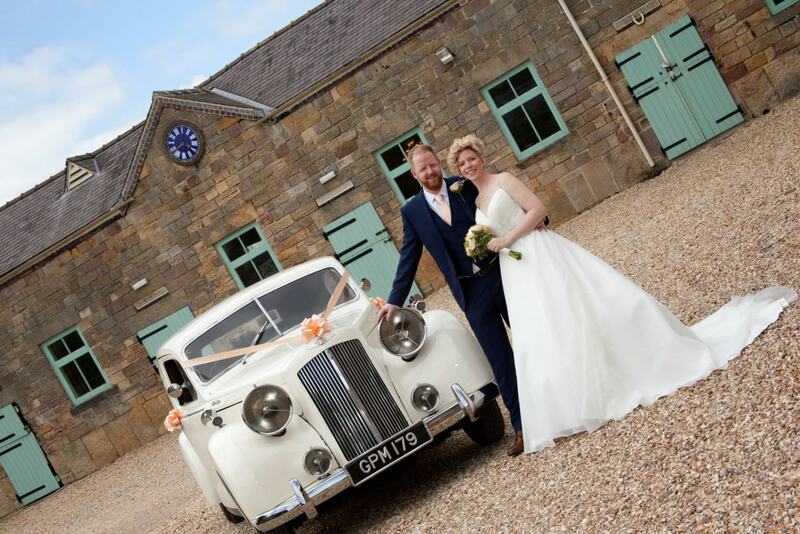 We had the fabulous all day DJ package from Paul at Spirits High Entertainment. I adored the mint Postbox and giant games he provided. Any other details that you would like to share about your day: We had a BBQ for the wedding breakfast which everyone loved! We had a sweetheart table instead of a toptable. It was really nice to have some quality time just the two of us! Honeymoon: We are going to Crete!!! Best piece of advice to pass onto other couples: Try to take a moment to yourself just to take everything in!!!! !